Last night, after my lovely children were all tucked into bed, I decided to go and have a really hot shower to wash the chaos of the day away. The red Kool-Aid on the carpet, the sand from shoes dumped out everywhere, and the huge piles of laundry...all disappeared down the drain. Oh and I should mention how nice it was to have a shower ALONE without little eyes peering at me through the fogged glass door. I also made sure to lock the door so no one ELSE would interrupt me...know what I mean? 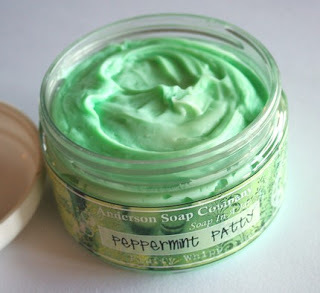 In addition to having some time alone, I was also excited to try out some of the wonderful handmade soaps I got in the mail from Anderson Soap Company. I swear, once you try handmade soap, you'll never want to go back to that crappy grocery or drugstore stuff. Never! Tonight, I have a huge chunk of Lemon Poppyseed soap to try...or maybe I should go for the God Save The Queen Beer Soap. 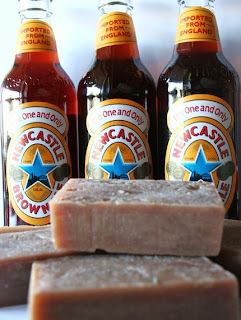 That's right - soap made with Newcastle Brown Ale beer. I bought it for the man of the house, but seriously, I'm really the one who needs alcohol and I'll take it in any form I can get! After my wonderfully refreshing shower I made myself a huge cup of coffee and began crafting while Inglourious Basterds played in the background. I whipped up 11 fabulous fabric key fobs using my top secret no-sew technique. 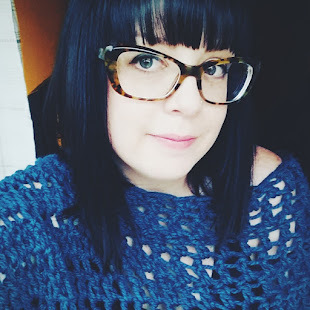 I'm thinking I should write a tutorial - it would be perfect for all those crafters out there who fear sewing machines as much as I do. I'll be listing these in my Artfire shop tonight...probably after the kids have gone to bed and I've lathered myself up in wonderful beer scented soap suds.